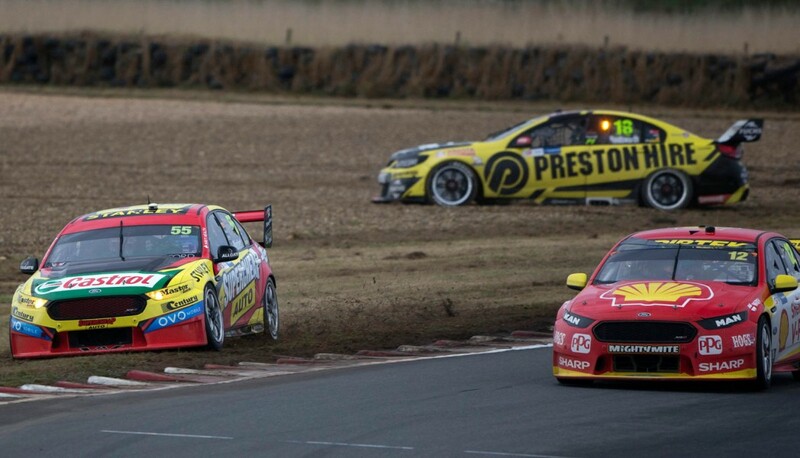 With the dust finally settling after a dramatic Tyrepower Tasmania SuperSprint, Supercars.com's Stefan Bartholomaeus reflects on the biggest talking points and lessons from Symmons Plains. It grabbed national news headlines, spread across the world online and triggered lengthy debate about track conditions, driving conduct and penalties. 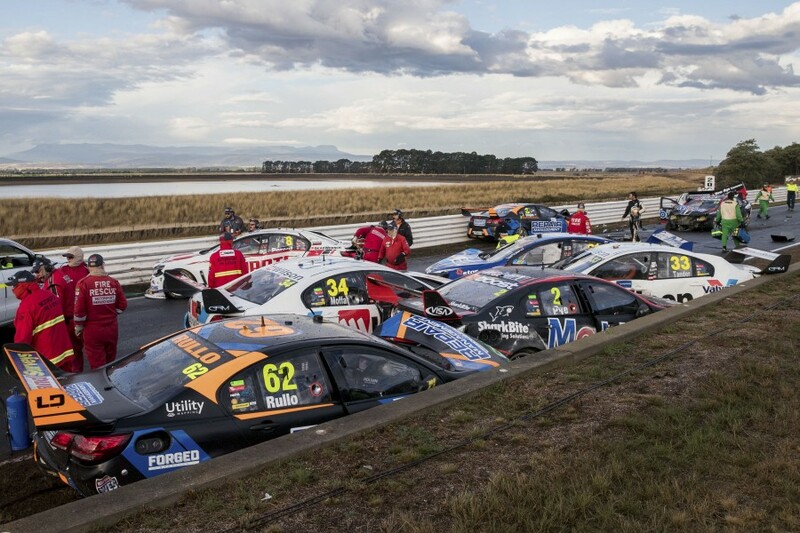 There’s no doubt that the accident at the start of Race 3 was the biggest talking point from Tassie, but what other than two injuries and a heap of bent metal do we take out of it? Firstly, there is no one element or individual that causes an incident like this. The actions of several drivers contributed, as did the conditions and the narrow nature of that part of the circuit. It was, as they say, a perfect storm. While the investigation into the full pile-up is yet to be completed, what is clear is that an action that puts another car out of business will likely be deemed reckless driving and cop a significant penalty. Coulthard losing grip in those conditions and making side-to-side contact with Kelly may have appeared relatively innocuous, but it directly put both Kelly and Slade out of the game and, for now, has prevented the Kiwi from taking the championship lead. 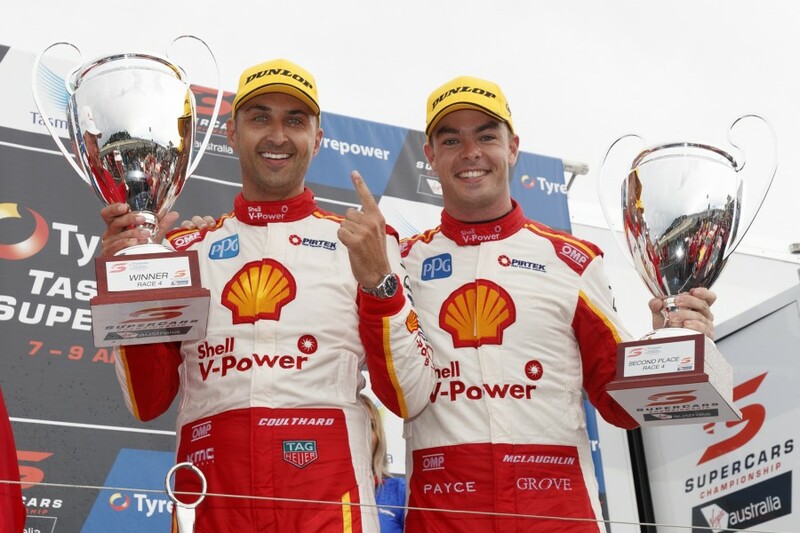 On the subject of the championship points table, Symmons Plains should remove any doubts that Shell V-Power Racing is a genuine championship threat this year. Speedy at Sydney Motorsport Park, Adelaide, Albert Park and Symmons Plains, this team has a package that can be quick anywhere and the team’s Ludo Lacroix-led engineering group is proving good enough to unlock that performance. Just as notably, both drivers appear to be up to the task. Following how the dynamic between these two very different characters progresses off-track during the season will be just as fascinating as the battle on it. It wasn’t an entirely perfect weekend, however, especially on Saturday, where Coulthard qualified down the order and a communication mix-up saw McLaughlin called to pitlane under the red flag. Although ultimately meaningless thanks to the decision not to award points, the latter could have cost the youngster more ground that he can’t afford to lose after his costly Safety Car infringement penalty in Adelaide. The only thing louder in the paddock on Saturday evening than the sound of slide hammers and angle grinders was that of those lamenting the way that the race suspension and resumption unfolded. Once the emotion rescinded it was evident that while race control had operated in accordance with the rulebook as it is written, there are several elements that need a tune-up. Clearly, rules stipulating a minimum lap or race time requirement for points – or a percentage thereof – to be awarded is necessary alongside a rethink of the mindset that currently sees a push to restart races even when no green flag running will be achievable. But, we must also realise that solutions like ‘just run the rest of the race the next day’ is easy to say but highly difficult to execute when one considers the real-world factors like TV schedules, support slots and turnaround times for the Supercars teams. Thankfully, the decision not to award points on Saturday made the best of an unfortunate situation. The team owners that supported the move despite losing a competitive advantage out of it should be applauded for putting the sport first. The biggest plaudits for the weekend, however, are reserved for the crews who worked tirelessly to repair cars for Sunday following the big accident in Race 3. Sure, fixing damaged cars is part of the job that they’re paid to do, but this isn’t about money or employment. It’s about passion, dedication and team spirit. Race weekends are hard enough on crews without the added drudgery of completely rebuilding a car as both time and temperature slip into single digits. 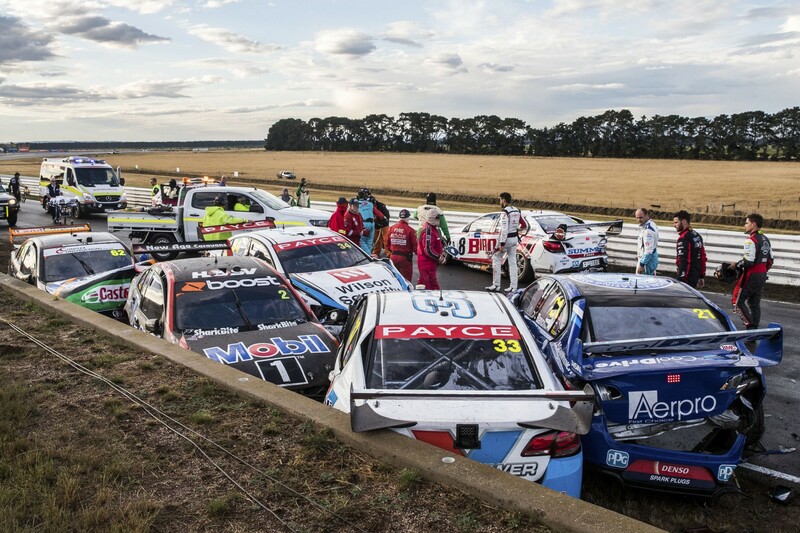 The scale of the Race 3 carnage was unprecedented in Supercars and made for both a surreal scene on Saturday night and some amazing stories on Sunday morning. Clearly, the work hasn’t stopped for many, with several squads – including the seemingly cursed Brad Jones Racing – now having to push through Easter to build up new or spare cars for Phillip Island. While the racing proved largely a sideshow to the sound and the fury of the weekend’s crazier moments, there were plenty of other notables to take away. Chaz Mostert was both the hero and the villain – brilliantly showing the Shell V-Power and Red Bull juggernauts the way before making unforced errors and losing the lead on consecutive days. While even such tiny mistakes are hard to excuse at this level, there is something very special about the combination of Mostert’s raw talent and the engineering nous, and careful coaching, of Adam De Borre. There has also been a notable shift from the garage next door, with Cameron Waters proving more than ready to throw an elbow at the established stars during his second season in the top flight. While the style has brought some criticism from rivals, Waters sits fifth in points – currently the top non-Red Bull or Shell entry – which is arguably the most positive surprise of the season to date. The opinions expressed in the article are the views of the author and do not necessarily reflect the views and opinions of Supercars Australia.